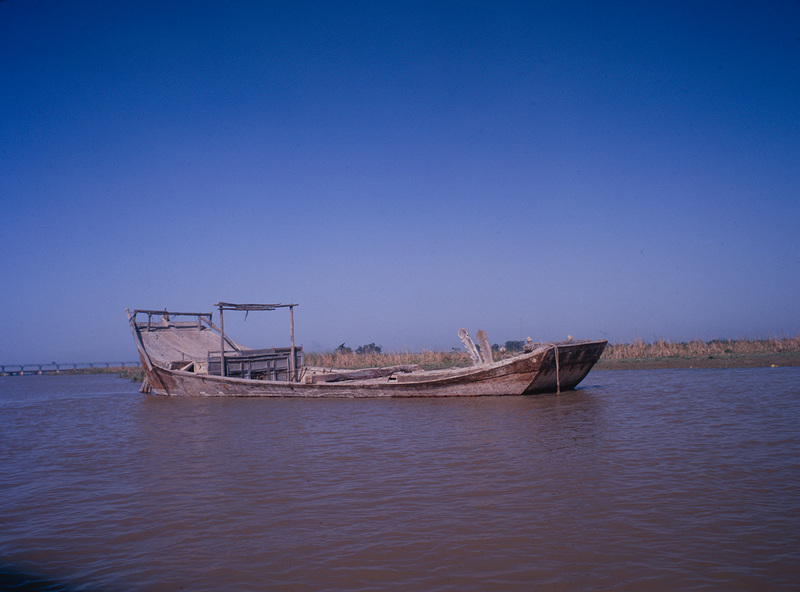 This shot was taken while we were travelling the area filming fishing communities living on the rivers here. The Panjnad River is formed by the successive confluence of the five rivers of the Punjab - the Jhelum, Chenab, Ravi, Beas and Sutlej, some 10 miles north of Uch Sharif in Muzaffar Garh district. The combined stream then runs southwest for approximately 45 miles and joins the Indus River at Mithankot. The Indus continues and then drains into the Arabian Sea. A barrage on Panjnad was erected by the British, providing irrigation channels for Punjab and Sindh provinces south of the Sutlej and east of the Indus rivers. I spotted this magnificent old boat, sunk on a sandbar in the Panjnad River and stopped to photograph it. A fisherman spotted me and offered to take me out to see the vessel close up. I would be very interested to know how old such a boat might be and what it would have been used for!